“Gration Must Go” is the call that has just been put out by some U.S.-based Darfur advocates – including people that, I should disclose, I respect the work of. 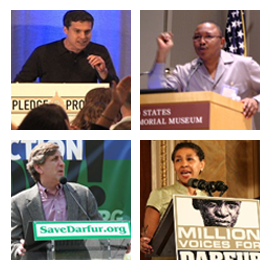 They are sincere people, genuinely committed to improving the lives of people in Darfur. And yet I think that in making this call they are setting their considerable advocacy skills in the wrong direction. I am drafting a proper piece on this issue now, and in the likely event it doesn’t get published anywhere else, I will post it here. But my concern is that we have been through all this before – – to the benefit of no one but Khartoum. In part, the call for Gration’s removal comes from his statement before a press briefing on Wednesday that “What we see [in Darfur] is the remnants of genocide.” This launched the advocacy “twittersphere” into a debate on whether Darfur was an ongoing genocide – a fight that was played out between the U.S. and the rest of the world back in 2004. The result was a divided international community that couldn’t pull together with one voice against Khartoum. However, the focus on Gration himself is also symptomatic of another recurring miscalculation by portions of the advocacy community – namely to put more value in the role of a Special Envoy than it really deserves. If President Obama disagrees with Gration’s approach, he has the ability to pull Gration back in line. If he doesn’t, then advocates should realise that their real beef is with Obama’s policy, not with Gration himself. The U.S. could have stopped this genocide then … and it can now. Gration must simply get down to the nuts and bolts of the killings: STOP IT. Darfur issue is as important as the Gaza issue, pay attention to the details. You are right that our “real beef is with Obama’s policy.” We have been consistently outspoken on this issue and have called on Obama to live up to his campaign promises which included sticks as well as carrots when dealing with Khartoum. Hopefully this new focus on Gration will be a wake-up call to the Administration that many members of the advocacy community are very disappointed in the Administration’s performance in dealing with the Darfur genocide. Whether Obama replaces Gration or, as you suggest, “pulls him back in line,” the true measure of success will be when the millions of displaced Darfuris are back in their rightful homes and living in peace. Hi Bec— I don’t think Grations’s statement at the press briefing launched the twittersphere into a debate on whether Darfur is an ongoing genocide. I agree that debating “is it genocide” is a distraction, doesn’t help Dafuris and only helps Khartoum. Rather, I think Gration’s comments and the commentary that followed highlight the fact that the Obama administration does not have a coordinated message on Darfur or a comprehensive Sudan policy yet. And this is not acceptable. The administration has been buying time – and Gration’s comments sounded the alarm. It is the job of activists to push Obama to lead and to demand that he not only “pull Gration back in line,” but get all those who work for him working in coordination to finalize and implement a comprehensive plan. Whether Gration is replaced or not, targeting him is a tactic to support this greater advocacy strategy. Activists need to use all tools in their toolbox to get Obama to feel the heat and finally lead. Thanks for the comments. We are all on the same page in terms of the ultimate goal – protection for Darfuris. It’s just a matter of differences in the means to get there. I hear what you are all saying about targeting Gration as a tactic in service of a broader goal – and I appreciate the benefits of some parts of the movement staking out a radical position in order to benefit the whole. I just find it strange to call for something which, if successful (i.e. if Gration was removed), would be a bad result. Maybe we differ on this, I’m not sure. To my mind the last thing we need is yet another new Special Envoy having to start over from scratch – One of the (many) frustrating things in my research is seeing how every time we have had someone new come into this position over the past 6 years, there’s been a minimum 3-month learning curve. Darfur doesn’t have time for this. A sort of P.S. on Colleen’s point about whether or not the “twittersphere” got back into the debate about whether it’s genocide. I did see some signs of it – but more troublingly, do a news google search and see how the media has focused on the “remnants of genocide” line. I guess it’s ok if that is just the hook into the question of coherent policy – I just fear the 2004 debate redux which ended up being so divisive among people who would otherwise have been unified against Kht. Gration is the mouthpiece for another set of failing policies. The policies need to change. Gration SHOULD go, but the policies MUST change. In the April 30 release of the State Department Country Report on Terror (Chap 3, State Sponsors of Terror) the U.S. admits it is training the Sudanese intelligence services. This has to stop. American needs to stop walking both sides of the street with Khartoum. WRT: Genocide: What I see is the Khartoum government allowing its proxy forces to settle on lands left vacant for three to six years by the non-Arab victims of the Genocide. Khartoum has changed its tactics but not its intent: intentions are the difference. This is still genocide.